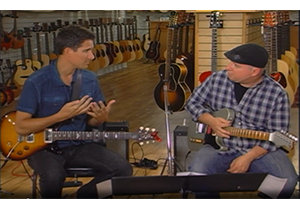 In this free live guitar lesson from June 23, 2015 with Steve Krenz of Gibson’s Learn and Master Guitar I join him to talk guitar theory, trade licks on a few jams, and promote my Fretboard Theory books. It is my third appearance on Steve’s broadcast out of the legendary Gruhn Guitars in Nashville, Tennessee. You can follow along with our guitar jams by using the guitar tab and song details on my Just the Two of Us Chords and Hotel California Guitar Solos pages. I used a PRS Guitars​ DGT, Truetone​ Volume pedal, VS-XO dual overdrive, and Dual Tap Delay, Line 6​ M5, Boss RC-3 Loop Station, and Fender Hod Rod Deluxe amp. To learn more about music theory for guitar, including scales, chords, progressions, modes and more, sign up for a free preview of my Fretboard Theory books and DVDs by using the form on this website. Visit the Steve Krenz Guitar Gathering website and be sure to join the email list in order to stay informed about live lessons, guitar resources, and community news.